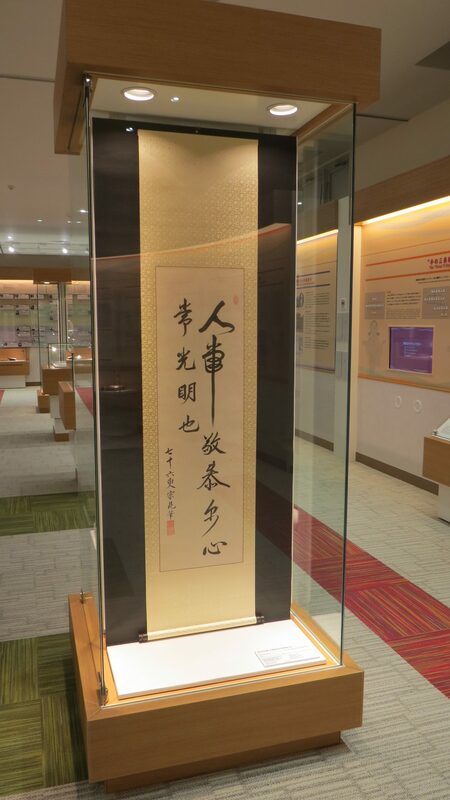 In the Archives of the Okinawa Karate Kaikan is exhibited a brushwork once calligraphed by late Matsumura Sōkon, the great karate master. The sentence composed of 10 characters was once introduced in Miyagi Tokumasa’s book “Karate No Rekishi” published in 1987 by Okinawa Bunko. The piece exhibited in the Archives is a replica of the original. It seems that this phrase was taken from the “Zhuzi yulei”, a collection of conversations relating to neo-Confucian scholar Zhu Xi. In this splendid calligraphy by Matsumura Sōkon who adopted the calligrapher name “Unyū” and was also called “Buchō” the head of martial arts, the second character on the right from top reading “常 – Tsune” or always is particularly beautifully written. The viewer can easily imagine a revolving sai, the trident of kobudō or an ornamental hairpin called jīfā in Okinawa. 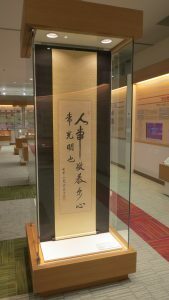 Do not miss to visit the Okinawa Karate Kaikan to admire the calligraphy of Matsumura Sōkon, a man who is considered as one of the “Chūkō no so (2)” of karate. (1) One translation could be: If one is always respectful, that is the heart will always be bright. (2) Chūkō no so: There are 3 masters considered as the rejuvenators of karate: Matsumura Sōkon (Shurite), Matsumora Kōsaku (Tomarite) and Higaonna Kanryō (Nahate).